Happy Bloggers Challenge Friday! Thanks to those who played along with the Summertime Challenge! The challenge this week is Friendship. 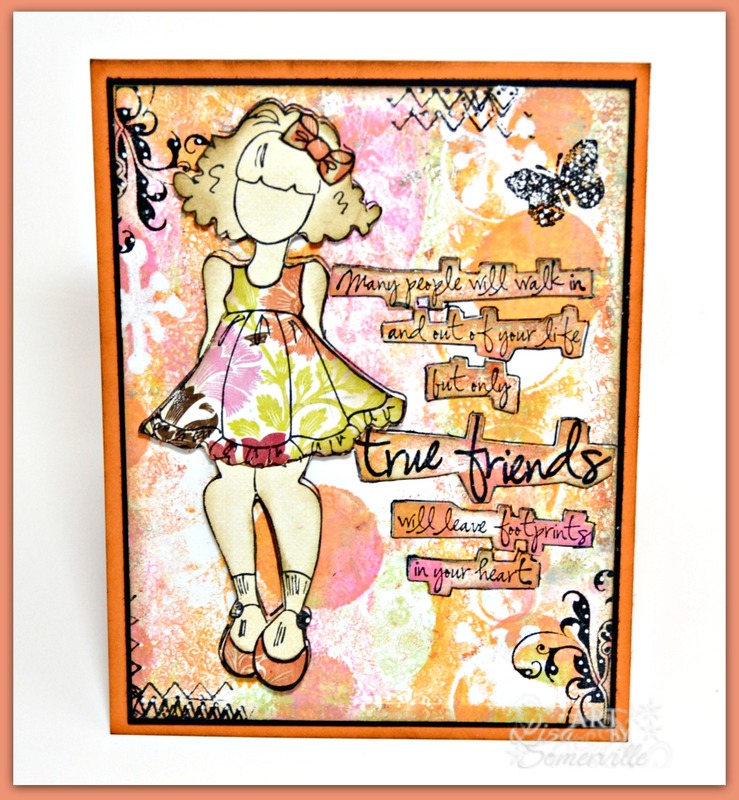 I created a Mixed Media card using the Gelli Arts Plate along with stamps from Prima, Verses and Art Gone Wild. To create the background panel, I applied DecoArt Americana Multi-Surface Satin Acrylic Paint in Flamingo Citron Green and Orange Sherbet to my Gelli Arts Plate, then added the Dottie and Jacks Stencils from Just a Trace and some Punchanella to the plate, and made a print onto Mixed Media Paper. I stamped the quote from Verses (Footprints in your Heart) on a scrap piece of the monoprinted background, cut it out, sponged the edges and applied it to the panel using DecoArt Decou-Page. I stamped the Julie Nutting Doll (Prima) on a piece of scrap pattern paper, then paper pieced her using scraps of paper from Authentique, sponged the edges and adhere her to the background panel using Decou-Page. I used a STAEDTLER Fineliner to draw around the stamped panels for added depth. To add a little more interest to the panel, I randomly applied Gesso to the Jacks Stencil, and added stamped images from Art Gone Wild.